Blown glass "damascene" gold "Favrile" 10 inch shade, model #415. "Wave" pattern, on a "counter balance" base. 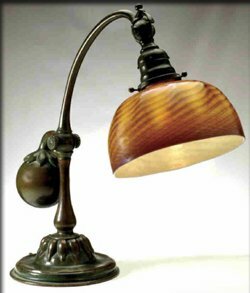 These lamps produced a decent reading light, and had various sizes of shades and a few variations of the counter balance base "ball" as well.